This post is a continuation of the main article on Dances's Square, Crescent and Circus which gives an overview and sets the context of this series of posts. There are further posts on the related locations of The Crescent and Circus as part of this series. The northern part of the planned residential development by architect George Dance, the Younger was America Square. The name is likely to be a dedication to the merchants trading in the American colonies at the time and for whom this development was designed to attract as potential residents. Completed between 1768-74, America Square originally consisted of sixteen houses arranged on three sides (West, South, East) of a small cobbled square, with the houses along Crosswall (known then as John Street) making the northern side of the square. Each house was four storeys tall, with an additional basement level, and most were three bays wide. 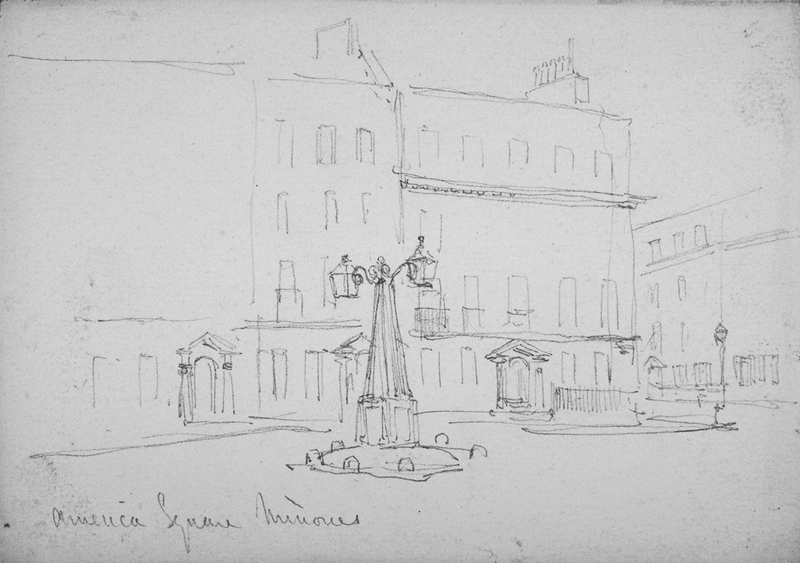 In the centre of the square stood a small stone obelisk affixed with ornate lanterns, as can be seen in the simple but effective sketch below dating from circa 1850 by the artist Thomas Colman Dibdin. Sketch of America Square featuring Nos. 14, 15 and 16. Looking west. c1850 by Thomas Colman Dibdin. Reproduced by permission of London Metropolitan Archives. The most noted resident of the square was Nathan Mayer Rothschild (1777-1836), the founder of the English branch of the great Rothschild financial house, who lived at No. 14 during the early 19th century on the west side of the square. No 14 is barely illustrated in the sketch above as the left-most house with just the ground floor drawn. Unfortunately the hey-day of the square was not very long lived. In 1841 the railway viaduct to Fenchurch station sliced across Vine Street directly between America Square and The Crescent, in the space where stabling yards had been located, effectively separating the two elements. Forty years later in 1881, the Fenchurch viaduct was widened on it's northern side, resulting in the truncation of the square with the loss of the southern row of houses (Nos. 8-10) and the south-most three houses on the west side (Nos. 11-13) of America Square. In 1908, Nos. 15 and 16, the other two houses featured in the above sketch, were demolished as part of a planned development of new offices. It was during this construction work that a large section of the Roman wall was discovered and recorded in detail. 15-16 America Square c.1915. Looking South-West. Anon. photographer. Reproduced with permission from London Metropolitan Archives. The photograph above shows the new building in 1915 shortly after it's completion. Number 14, the former home of N. M. Rothschild, had survived to this time in fairly original condition and can be seen adjoining the left side of the new building in the photograph above and also in more detail in the photograph below. Detail of No. 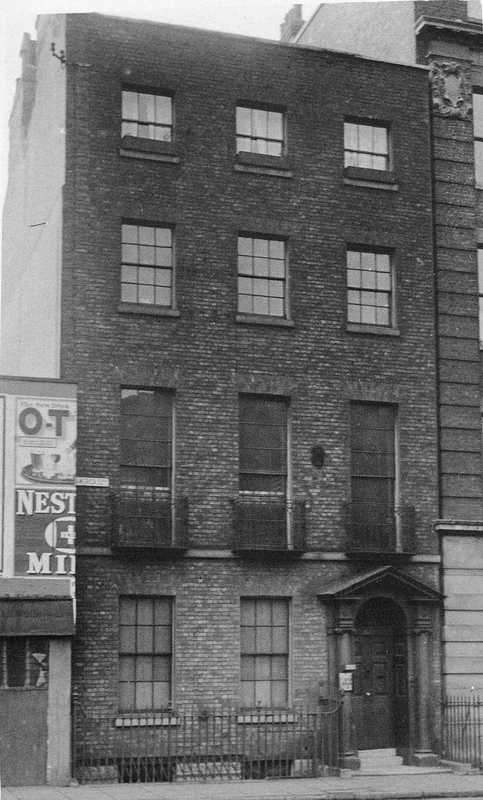 14 America Square c.1915. Photo taken facing west. Anon. photographer. Despite the intense bombings of the City of London during the 'The Blitz' from September 1940 to May 1941, America Square had survived unscathed unlike its neighbours The Crescent and The Circus. However, from June 1944 a new threat appeared in the skies over London: the V-1 or 'Flying Bomb', and it was one of these that caused the devastation of the eastern side of America Square, as shown below. Ruins in America Square from a V-1 strike in 1944 looking south-east to the Fenchurch railway viaduct. Photograph by Arthur Cross and Fred Tibbs. Reproduced with permission from London Metropolitan Archives. 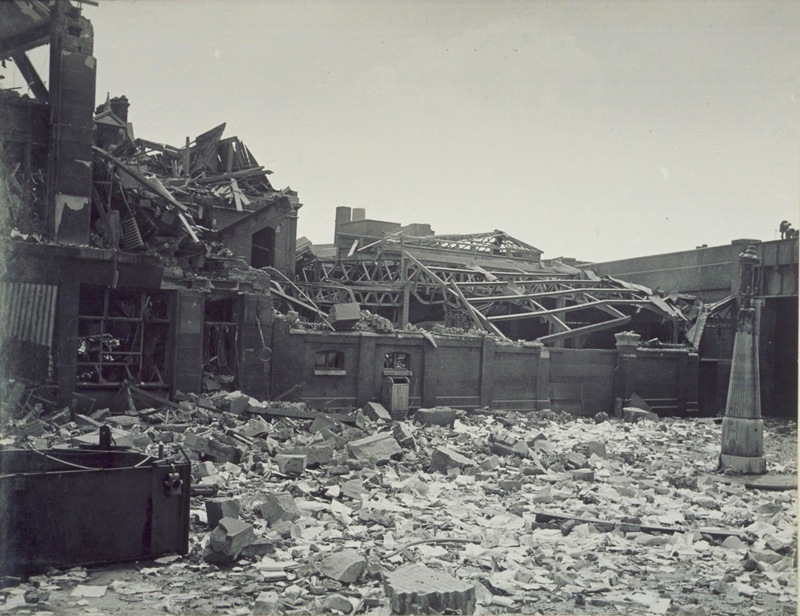 This photograph was taken by City of London Police Constables, Arthur Cross and Fred Tibbs, who recorded many of the bomb sites in the City of London during the war. Collections of their works can be seen in the Museum of London, and at the London Metropolitan Archives. Despite the ruin, the original obelisk seen in the 1840s sketch above can be made out on the right of the photograph above. Number 14 was also finally lost during this period as can be noted in the detail of the bomb-site survey map below. The circle denotes a V-1 bomb strike, and the purple coloured buildings on the right (east) side of America Square are those featured in the photograph above, designated as damaged beyond repair. By the 1960s America Square had been subject to sporadic redevelopments and neglect, with none of the original houses surviving. 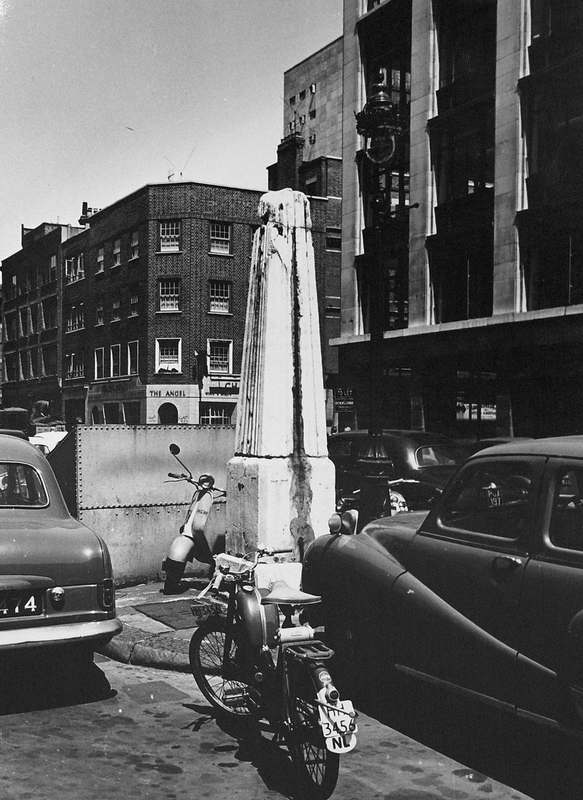 The last link to its grand beginnings can be seen in the photo below, which shows a rather sad looking obelisk which had survived at least until 1957. America Square, 1957, looking North-East. Photographer: James D Wills. I have not been able to find out what finally happened to the original obelisk, and when exactly it was removed from America Square. It is most likely to have happened during the construction of One America Square in the late 1980s, which would mean it would have been standing in place for over 200 years. 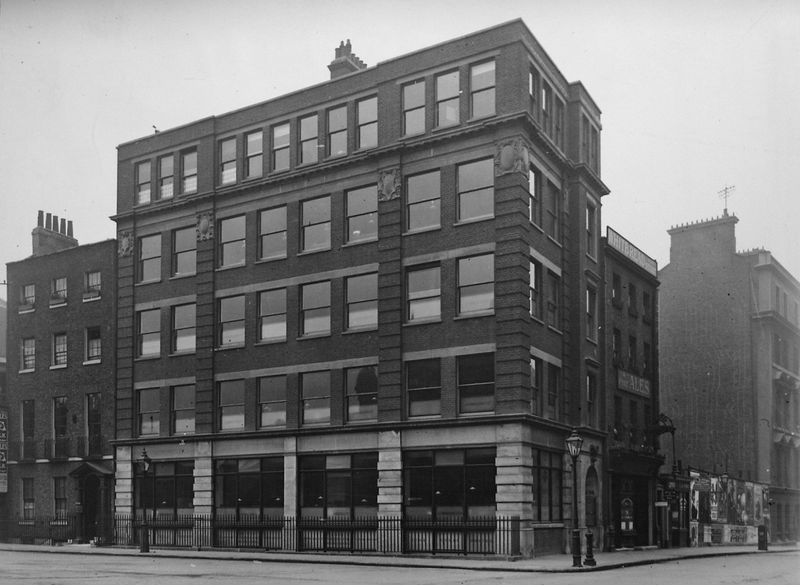 The 1908 office building at No 15-16 America Square, shown in a previous photograph remained until 1987, when it was in turn demolished to make way for the current development. The building occupying the west and south of the square is known as One America Square. It is a fifteen storey office complex which incorporates the platforms of Fenchurch station and was designed by RHWL Architects and completed in 1990. One America Square, looking south-west. The whole building is designed in a modern take on the Art Deco style of the 1920/30s. The ground levels are recessed behind columns of rusticated grey stone, while the upper levels are finished in polished stone with Art Deco detailing in the form of contrasting zig-zag patterned borders along the upper horizontal edges of each elevation of the building. There is also use of large sections of curved glass for the gable ends and the high-level atrium. Art Deco detailing above eastern entrance of One America Square. The entrances have been decorated with art-deco styled chrome-work. 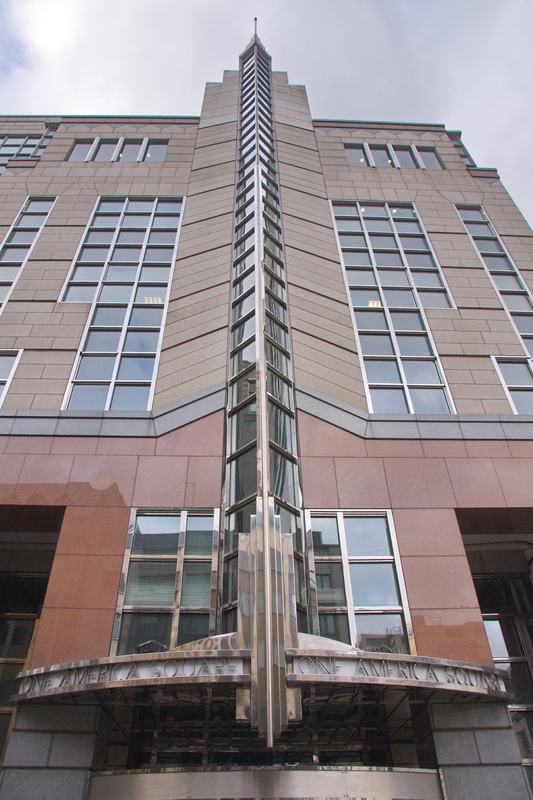 The triangular projections that rise from the entrance canopies up and above the full height of the side elevations of the building are topped with chrome finials, some being used as flag poles. 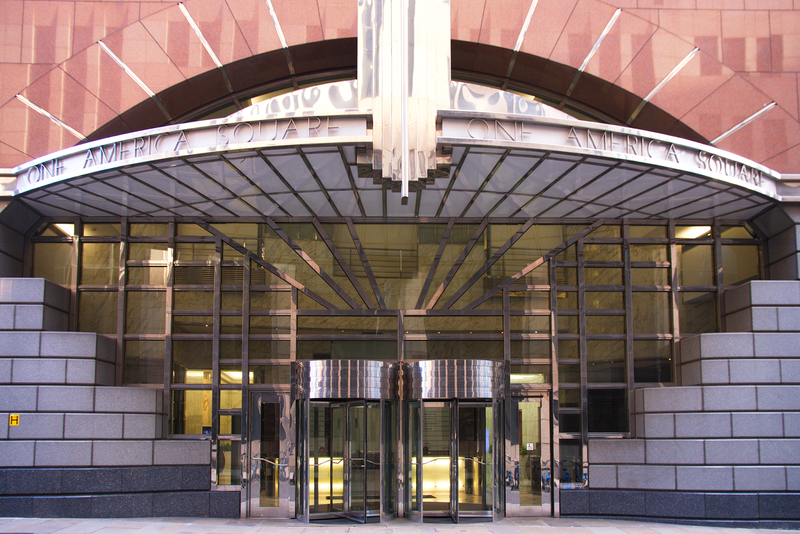 Main entrance to One America Square on the northern side from Crosswall. The main entrance has a classic art-deco sunburst pattern executed in the chrome window framework, and the entrance lobby is finished in white and red marble with brushed stainless steel or chrome fixtures and fittings. 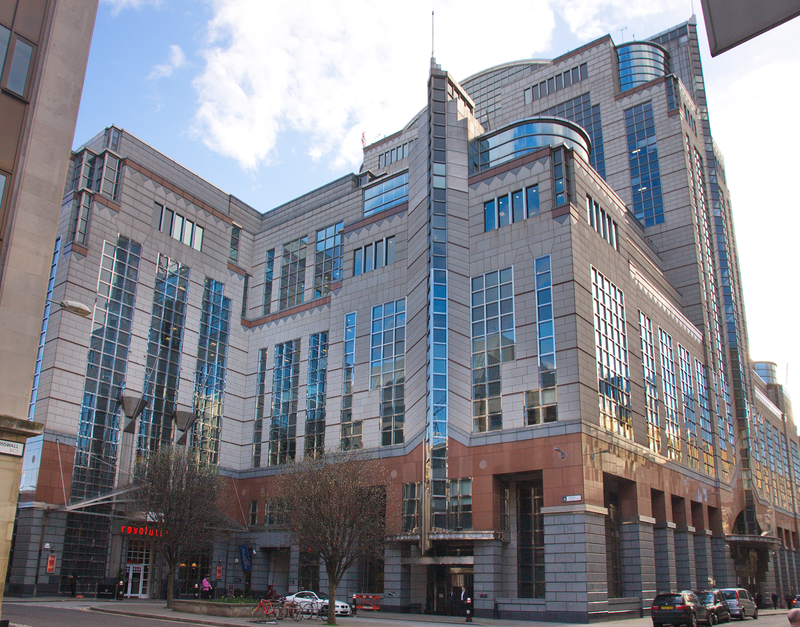 The building on the south east side of the square known as Two America Square, dating from 1987-9 and designed by Sir John Burnet, Tait & Partners, is described by Pevsner as "a shockingly tawdry exercise in Postmodern pattern making". No.3 America Square on the north-east corner, with a Pret a Manger on the ground level, is also known as Oxford House, 15 Crosswall and likely dates from the 1930's. It was severely damaged by the V1 bomb strike in 1944, but repaired and was last externally refurbished in 1992 by Architects RWHL partnership who also completed One America Square opposite. 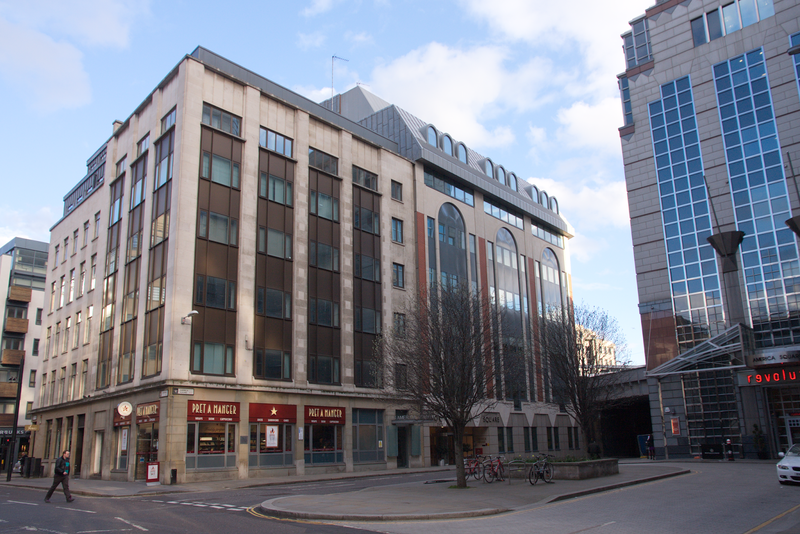 More recently the top floors of Oxford House have been converted from office space into nine apartments along with improvements to the buildings entrance in America Square. In the centre of the square, there is now a small raised flower bed and two trees, where the stone obelisk once stood. During the construction of One America Square, the section of Roman Wall first recorded in 1908 when the previous office building at 15-16 America was built, was again exposed and further excavated as part of the archaeological survey of the site. Due to the scale of the building project, more of the wall was revealed along with the foundations of a 4th century Roman bastion (No.4). The remains of the Roman wall were preserved and incorporated within the new development, and are on display in the basement of the current building. The Roman wall in the basement is partly visible from street level by looking down though the glazed panels that are situated in front of the recessed ground floor walls. It was this wall section that was the inspiration for my very first blog post and which started my quest to find other ancient artefacts lurking in basements within the City of London. As part of the Aldgate and Tower Hill Enhancement Strategy, America Square may become more pedestrian friendly with improved green space, lighting and seating as depicted in the artists impression below. In an earlier post regarding the remains of the Roman city wall at Cooper's Row, the adjacent location of The Crescent, EC3 was featured several times. I had originally intended just to add a few lines about the history of The Crescent as a side note in that post, but whilst researching further into its history I discovered it is part of a wider story which includes the neighbouring locations of America Square and the now vanished Circus. These locations being lost, forgotten and generally unsung, I felt they deserved a post of their own, in order to share their remarkable story. However, due to the volume of material I have now collated on these locations, this will now be split in to a series of posts in order to do proper justice to their histories. 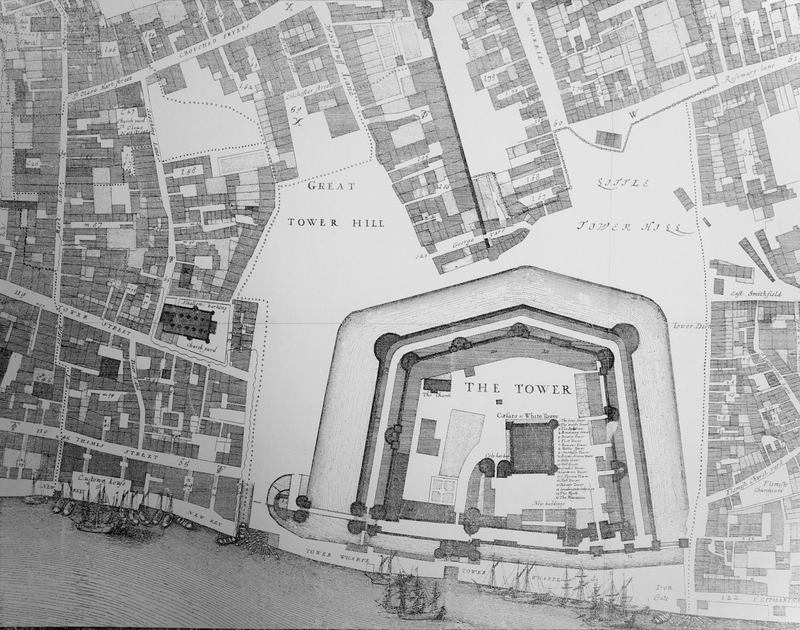 By the mid 18th century, the city wall had ceased to be useful as a defensive structure, and the limits of the city had spilled beyond its boundary, most parts of the London city wall had become engulfed by buildings either abutting or consuming it within their structures. Even the large defensive ditch which ran along the outside of the wall had been filled to provide level building land. For some reason this intense redevelopment seems not to have happened to land immediately outside of the wall, parallel to the street known as The Minories, which incidentally is named after the Franciscan convent of Holy Trinity of the Minoresses, founded in 1293 and formerly on the east side of the street. From further research, the land here appears to have been owned and managed by the the Corporation of London's City Lands Estates, and may have been used for leasing as allotment gardens which could explain why the space was still undeveloped at this time. The buildings directly to the east of the wall and fronting the west side of The Minories had an unused void between them and the old city wall. This can be clearly seen in the picture below of Ogilby and Morgan's map of 1667-79, also accessible on the British History Online website. The city wall is the dark diagonal line heading from top-centre down towards the Tower of London, with white space immediately to the right being the land of interest to this post. Tower Hill section of Ogilby and Morgan's map of London 1667-79. In the late 18th century, London was enjoying an economic boom brought about from being at the centre of commerce and trade with the Americas and the East. With the proliferation of new warehouses in the City servicing the Port of London, and new docks being developed to the east, there was a demand for quality housing which would appeal to wealthy merchants and their families. Having acquired the lease for the small space of land between the City Wall and The Minories, Sir Benjamin Hammett (1736-1800) a prominent property developer, city alderman, and banker at that time, commissioned the architect George Dance the Younger (1741-1825) to design a high quality speculative residential development to attract these merchants to reside in The City as an alternative to the developments of London's West End. George Dance was 26 years of age in 1767, and had been only two years in practice with his father (George Dance, the Elder 1695-1768), after returning from Rome as part of his "Grand Tour". This commission would be one of his earliest works in London. Dance's plan for a sequence of a Square, Crescent and Circus, introduced such design elements to London, and in doing so was the first planned crescent and circus in London. Probably influenced by the Woods' (another father / son pairing) grand work in the spa town of Bath, Somerset, albeit on a much smaller scale, Dance would repeat this sequence again in the City of London with Finsbury Circus and Finsbury Square some ten years later. Other architects also used this sequence in London, with the perhaps the most notable being John Nash's linked circuses (Oxford and Piccadilly), crescents (Lower Regent Street and Park Crescent) and square (Waterloo Place). The development was completed during 1767-74 and was one of the earliest planned residential developments in London and one of the few such developments of this period to survive in the city. As can clearly be seen in the spectacularly detailed map by Richard Horwood from 1792-99, the completed project consisted of a small square of sixteen houses houses; a crescent of eleven houses and a small circus of ten houses and other buildings. 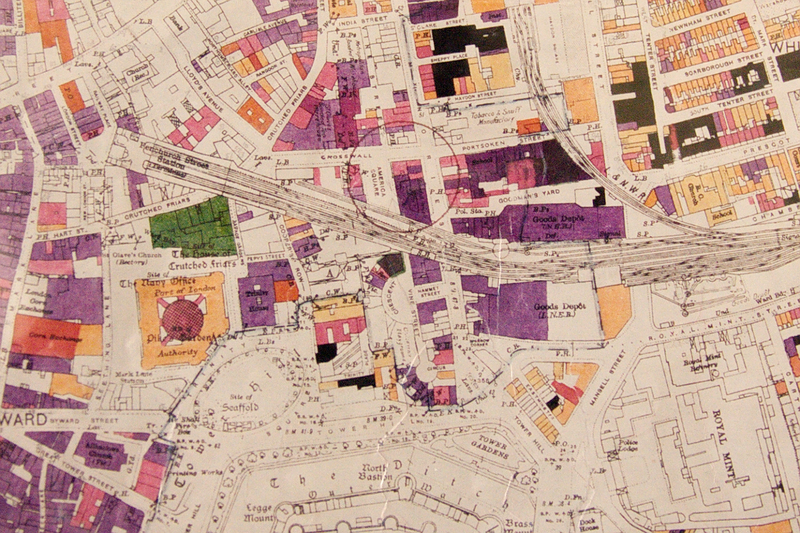 In addition to the houses the development included storage buildings and stabling for horses and carriages, located in the buildings opposite The Crescent, and in the spaces between America Square and The Crescent and also between the The Crescent and the The Circus as can seen on the map below. Richard Horwood's map of London 1792-99. Reproduced by permission of the London Metropolitan Archive. The project's property developer Sir Benjamin Hammett managed to achieve immortality in these plans in the form a street named after himself. It can be seen as Hamet St (sic) in the map above (now Hammett Street), connecting The Crescent to The Minories. Despite their architectural significance, time has not been kind to the original houses in Dance's development. In 1841, with the opening of the City of London's first railway station Fenchurch Street, the approaching railway viaduct sliced across Vine Street between America Square and The Crescent. Then in 1884, the Metropolitan District Railway (Now Circle and District Lines), sliced diagonally though the southern half of The Crescent, necessitating the loss of five of the eleven the houses. The aerial bombing of the City of London during World War II, caused much loss of life and property with a third of the buildings in the City being destroyed during the war. Here America Square was devastated with the total loss of the remaining original houses, in The Crescent, four of the remaining six houses were destroyed, and in The Circus just one house and an adjacent warehouse survived the war. The map below details the devastation around Dance's development, which can be seen in the centre. The colours represent the severity of damage. 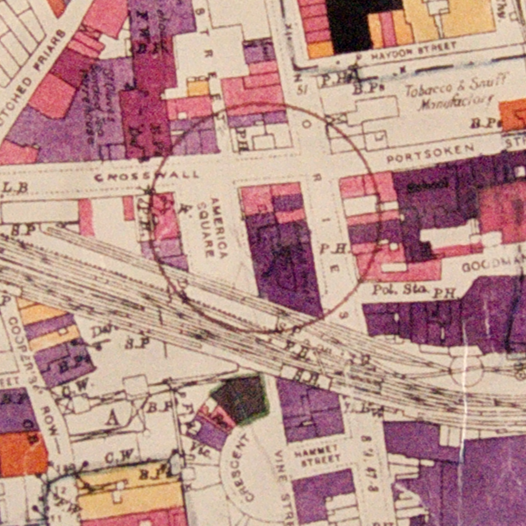 The circle just above the centre of the map is directly over America Square, with The Crescent and Circus below. Click the image to zoom in to a larger size. London Bomb Site Maps from World War II. Reproduced by permission of the London Metropolitan Archives. In 2007, The Crescent became part of a small conservation area known as the Crescent Conservation Area, which encapsulates the area of Vine Street, south of the Fenchurch railway viaduct, all of The Crescent, from the City Wall in the west to The Minories to the east including Hammett Street, and south to include the land formerly occupied by the now vanished Circus. This designation as conservation area, will hopefully ensure the historic character of the remaining buildings of The Crescent will be preserved, and that future developments will be more sympathetic to it's historic character.